Open the Internet Information Services Manager. Select the concerned web server in the left panel. Double-click on the server Certificates icon on the left. In the dialog box, click on Browser, apply the filter to *. * and select the file in which you have downloaded your certificate. Click on "Open". Give your certificate a unique name (do not use accents nor characters: ! @ # $ % ^ * ( ) ~ ? > < & / \:), then OK. 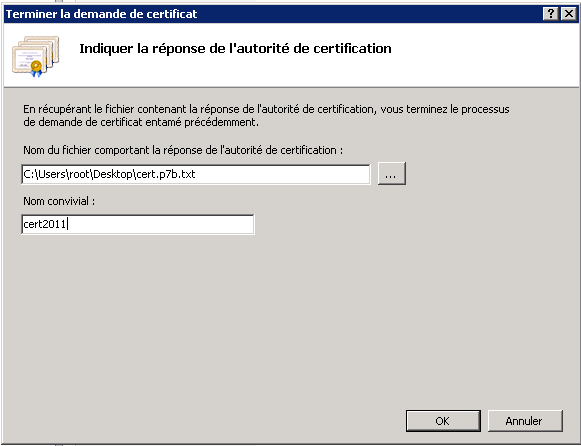 IMPORTANT: IIS7 often retur an error saying "Cannot find the certificate request associated with this certificate file.' Despite of this bug, the certificate is usually well installed only without the single name. Then you need to check that it has actualy been added to the list. If so keep going with the procedure here under without taking notice of the alert. Still in the Internet Information Services Manager, select the concerned website in the left panel. In the Actions pane, click on "Bindings"
You may encounter error messages while importing a certificate (.p7b or .cer). "Cannot find the certificate request associated with this certificate file. A certificate request must be completed on the computer where it was created." "There was an error while performing this operation Details: CertEnroll::CX509Enrollment::p_InstallResponse: ASN1 bad tag value met. 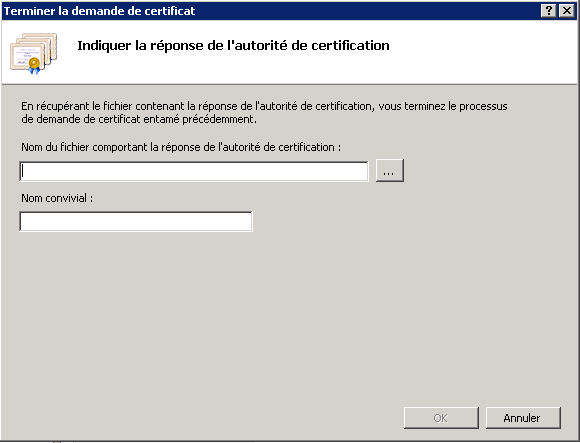 0x8009310b (ASN:276)"
This issue occurs because IIS Manager performs a lookup operation to look for a friendly name of the certificate during the installation. However, the code that performs this lookup operation misses this specific case, and it does not know how to retrieve the friendly name of a certificate in a PKCS#7 file. Therefore, the lookup operation fails, and you receive the error message. THE CERTIFICATE IS INSTALLED CORRECTLY DESPITE THE ERROR MESSAGE. Click Start, click Run, type certmgr.mmc, and then click OK. Locate the certificate (in "personal" / "certificates"). Edit the Friendly name field. Now test your secured website access with IE and Firefox. With IE 7 and Firefox 3 you may see an error message indicating the non-correspondence of the sites' names. It is normal, it is a local test. On your certificate status page, you'll see a 'Check your certificate' button. Click it to test the installation of your certificate. get protected from BEAST: consult the documentation. Here is our documentation about how to activate TLSv1.1 and TLSv1.2. We also advise disabling RC4 and 3DES based ciphers. We recommend enabling HSTS (IIS configuration). To limit the security risks linked to Diffie-Helman configuration and to the Logjam vulnerability, we recommand to configure IIS Cipher suites. For more information consult this documentation and this Microsoft documentation and the Mozilla recommendations about compatibility (be carrefull, those recommendations are not compatible with IIS, contrary to the 2 previous links). And discover IIS Crypto by Nartac, a toolthat will help you do modifications in IIS (compatible with IIS6). There us also a powershell script to apply all those security recommandations: external link.